“Realtors: Senate-passed Tax Legislation Bad News for Homeowners,” reads a recent headline from the National Association of Realtors. Lest this spawn a political debate, it should be noted that NAR’s membership is 1.3 million strong and that its PAC raises and disburses millions and million of dollars each year, and that those dollars are usually almost evenly split between the two major parties. Based on what we have seen, the big money must be on the other side of this issue. NAR cares not about Republicans and Democrats. Its focus is homeownership and Realtors. Its resources are infinite, and its research thorough. And the association says the bill “puts homeowners at risk.” Senator Bob Corker, as anyone who follows these things knows, voted against the bill. For those who are missing a program, Corker is a Republican. NAR president Elizabeth Mendenhall, a sixth generation Realtor from Columbia, Missouri, offered strong concerns over the bill and said the Realtors will continue work with members of the House and Senate as the process moves forward into a conference committee. She says there is hope in Senate/House reconciliation. There are 75 million homeowners out there. Many have wondered what could cause the city’s growth to slow. Perhaps this is it. Thirty-one years ago, when the Tax Reform Act of 1986 passed, there was celebration in Washington among those who passed the legislation. While I write about it in negative terms, there are those who feel it was helpful. But, they were not in attendance in Resolution Trust Corporation auctions the banquet halls of local hotels. There were condos listed on large Post-it notes easels with prices beginning at $25,000 for 1,200-square-foot condos across the area. One of the attendees bought a condominium on a credit card, never dreaming that he would buy anything at the auction. Pay down those balances and raise the credit limits, there may be some bargains to be had. One of Nashville’s top Realtors is Village’s Virginia Degerberg, whose sales prowess is understandable considering she cut her teeth selling air time at local radio stations. After selling the verbal ramblings of air personalities from Gerry House to Carl P. Mayfield, she broke into real estate and sold more than any other new agent in the Greater Nashville area that year. 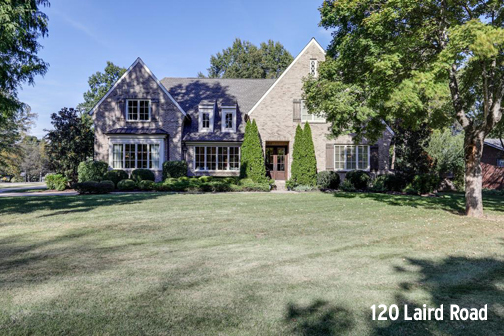 She has continued to prosper and recently sold a house in West Meade – some people call it West Meade, Degerberg calls it Harding Park – and garnered some $1,726,000 for its 6,652 square feet. With five bedrooms, five full baths and a couple of half bathrooms, it has three garage bays and rests upon .62 acres. Located at 120 Laird Road, the $1.7 million price tag is robust. Houses with spectacular kitchens, some sizzle in the bedroom and outdoor areas will command that number. Barbara Keith Payne of the Pilkerton Company represented the buyer and beat the others to the punch with the house going under contract three days after Degerberg listed it for $1.75 million. With a new roof, gutters, water heaters and HVACs, the home is virtually new. A speaker once said that when a person precedes a claim with the word virtually, what follows in generally not true. Of note is that at one time this was the home of Daisy King of Miss Daisy fame. While Daisy King is driven, she is not famous for that. Rather she is a relentless chef, cookbook author, caterer, and philanthropist, one of the area’s true characters. Richard Courtney is a real estate broker with Christianson, Patterson, Courtney, and Association and can be reached at richard@richardcourtney.com.